Synchronicities come out, clearly display and develop throught the re-actions. Repeating something that comes from sore points of our interiority, permits/allows a sort of not-so-personal-revault. In this sense, digital is precious, because – after the performance – the video can be used as a further tool of investigation/research towards a collective/social reaction and revolt. The textile bust “Re-vault”is the central point. First created and used for a performance dedicated to Goliarda Sapienza (1924-1996) – is not a lifeless shell of sea and sky. Fluffy as a pillow, it is suitable to contain – without forcing in a permanent shape – traces of life, similarities and so, that are undetectable by the most but clearly visible to the eyes of the heart. 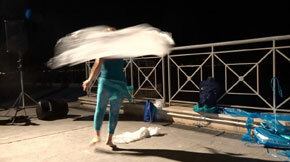 The performance in Gaeta on Tuesday, August 30th, at 21:00, under the waning moon (15%), on the floating battery, featured an emotional dialogue of corresponDANCES between Goliarda and me. When she was in her twenties, together with my mom – a few years younger than her – I was receiving/living “the imprinting of freedom” from the OPP of Gorizia, where Basaglia&team&around were starting the 1968. There and then a positive reaction against the marginalization arose. I experienced the life-giving power of the gentle but determined subversion. My first/only daughter was born when Goliarda was writing “The Art of Joy”. When she was in Rebibbia, I was the object/subject of a psychoanalytic therapy lasting five years, that I consider a graduation in the research of happiness. Around the time of her departure from this (only) physical world, I had a chance to paint in and for Sicily, her native land. The making of the first textile busts was also started. In 1998, some of my paintings were violated. Soon after I remade and exhibited the works in the Open House “La Festa dei Buchi” to share the sorrow with neightbours and close friends. In 2006, when she was given a proper burial in the cemetery of Gaeta, I dived in a consonant music: “MareA” by Dario Della Rossa. The same tune was re-used in the performance there, to make her – at least for a while – re-di-viva again. The art action continued in Naples few days later as an impromptu, next to a real Siren in a fountain and – to tell the truth – is perhaps an open scheme for my everyday reactions and revolts.